Ride the USA-Day 4: Coronado Trail Scenic Byway | reDeploying! When Dave and I rode across the country in 2007 we met a group of riders from Arizona in the town of Kanab, UT. The obvious leader of the group was emphatic about a route on the eastern border of Arizona called Coronado Trail. I committed to ride it some day, and made certain to do so when planning this trip. It did not disappoint. In fact, I think it was one of the best rides I’ve been on with high mountains, hundreds of turns, beautiful vistas, and the perfect temperature. It comes very close to the Cherohala Skyway that stretches from eastern Tennessee into western North Carolina, which we traversed in 2007 with hints of Lassen National Forest and several areas in which I’ve ridden in Idaho, Wyoming, and Montana. A key difference is the geology revealed by the carving of hillsides to make way for the highway. Safety is the highest priority when riding a motorcycle. That seems obvious, but it takes constant concentration to make any ride as safe as possible. Control through turns is maintained by looking to a place in the road around the turn where you want the bike to end up. Looking straight forward, or away from the turn ensures you’ll ride off the road. So, when riding one can only peek or glance at the surrounding beauty, not look or watch. There is little margin for error. So a good ride takes time for the stops along the way to take in the surrounding sights. 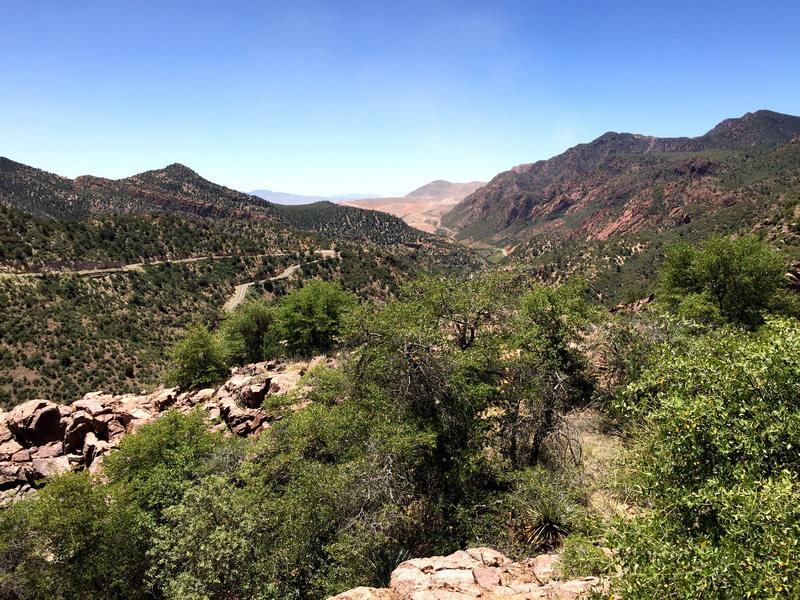 The White Mountains area near Alpine, AZ is magnificent. There was a major wildfire in the area in 2011. As I was riding along I suddenly was surrounded by wildfire devastation. As I rounded a turn I caught a glimpse of a Smokey the Bear sign silhouetted by burned trees. Made me laugh. I couldn’t stop to take a picture, and there were no turnouts within a reasonable area to make it back to take one. I wish I could have shared it with you. 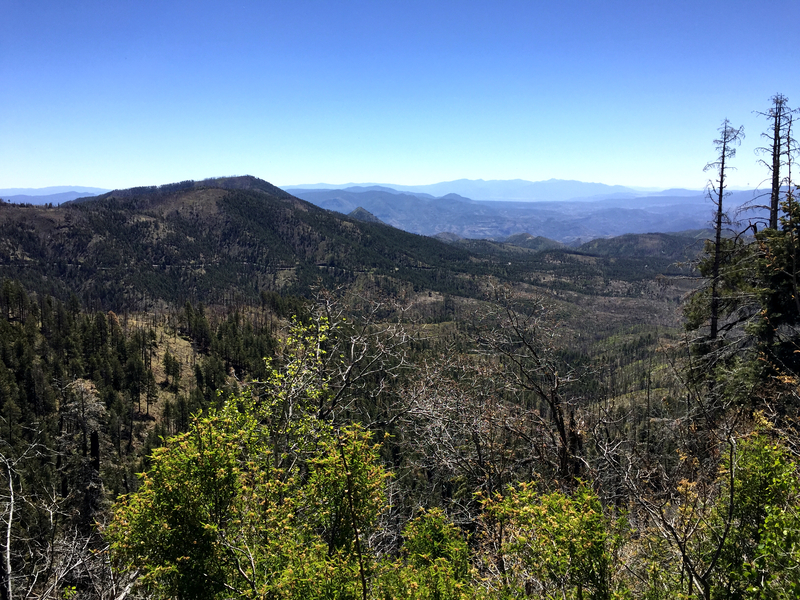 As the road left the Apache National Forest and the terrain changed and the temperature rose quickly. The riding was still fantastic. The song God of Wonders by Third Day & Caedmon’s Call randomly popped up on my stereo, and took pause to fully absorb His beautiful and diverse creation. I stopped to take this picture, and noticed the quarry off in the distance. I had no idea I was about to drive through miles and miles of quarry, and right through mining operations. It was amazing. Several stops I’d planned to make during the second half of the ride turned out to be nothing more than spots it he road. The temperature gradually increased to the mid-90s, and I made a beeline for Las Cruces. This entry was posted in Family & Friends, God, Harley Ride, Inspiration and tagged Harley, Harley Ride, Motorcycle by Gordon. Bookmark the permalink.